Adelaide - Former skipper Ricky Ponting weighed into the Shane Watson fitness debate on Tuesday saying the Australian vice-captain cannot play in the second Test against South Africa if he's not fully fit. Ponting said the injury-prone all-rounder would put too much pressure on his teammates if he played against the Proteas carrying a calf muscle strain. A decision was expected to be made on Wednesday or the morning of Thursday's match with Test rookie Rob Quiney on standby to retain his number three spot. 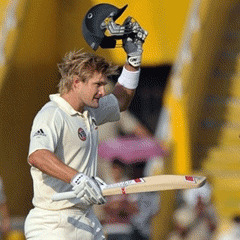 Watson, 31, took a fitness test Tuesday as he pushed for a recall as a batsman only for Thursday's Adelaide Test. Watson completed a number of running exercises but was not at full stretch in his workout at the Adelaide Oval. Ponting said Watson was looking good in the nets but was restricted from doing anything else in the field except slips catching. "It doesn't matter what we think as team-mates -- he will have a certain lot of criteria he will have to pass," Ponting told reporters. "There will be a certain amount of running he will have to do to prove that he's right to play a Test match. "No one can go into a Test match 70 percent fit. I don't care if you're a batsman and a slip fielder. If you can't bat at 100 percent, then you are putting pressure on other blokes as well." Ponting, turning 38 next month and facing his 167th Test match this week, said Watson would have to run freely between the wickets when batting. "Someone has got to run with him between wickets and I'm sure that will be in the back of his mind and it will certainly be in the back of the mind of our physio and doctors that are looking after him," he said. "They will make sure they tick all the boxes."